Long time OBcean, Jesse Egan, can be found these days hosting the late night talk show, “Tonight in San Diego”. If you attend a taping, or if you watch the show on-line – you are guaranteed a night filled with a ton of laughs! You may remember Jesse from running stand up comedy at Winstons. Or as the host of “Think and Drink” trivia night at Winstons. He has been bringing laughs to OB for 16 years. And now via the YouTube based show, those laughs will be coming from people city wide, nation wide, and world wide. Think of it as San Diego’s very own David Letterman Show. Or Jay Leno’s Tonight Show. Or the Tonight Show with Jimmy Fallon. The men and women working on Tonight in San Diego have a variety of backgrounds in comedy, theater, music, and video production, and this local show could be headed to Letterman-Leno, late night talk show status. Currently on YouTube, the show has potential to become huge. The excellent quality of material, the writing, the production team — this show is going places. And the show is definitely taking Jesse’s career to the next level. The show is currently sponsored by the Belly Up, the Lafayette Hotel, Real Office Centers, Hubert’s Lemonade, and Pop Chips. More ads, sponsors, and endorsements could come pouring in or the show could be picked up by a network. Only a matter of time. As for professionalism, talent, and quality — Tonight in San Diego has got all of that. It is a well oiled machine as it enters season 4. Things don’t often go so smoothly with a cast and crew working together for the first time, and the chemistry of a good team is apparent after a day or even a few hours on a film or tv set. The team working on Tonight in San Diego has excellent chemistry and the taping on Monday the 11th occurred seamlessly. Lights, camera, action — everything went just as smoothly as on any major Hollywood production. The Raw Space at Spreckels Theater. Monday April 11th was the opening night of Season 4, and the first night for Tonight in San Diego in the newly renovated Raw Space at Spreckels Theatre. 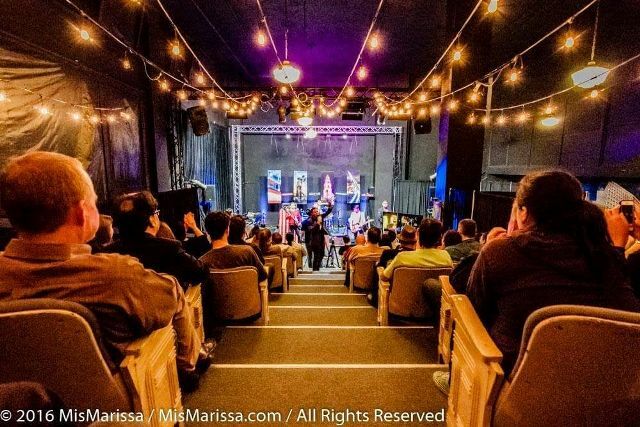 The Tonight in San Diego team raised $15,773 through a Kickstarter fundraiser, which enabled the show to renovate the dilapidated Raw Space. The Raw Space is a small theater around the corner from the historic Spreckels Theatre on Broadway. It is called the Raw Space because prior to renovation it was unfinished and old. It was in a “raw state.” The Fringe Festival and Side Stage Improv will also utilize the Raw Space, and the space is available for booking based on availability. The Tonight in San Diego team cleaned the theater space, sanded and painted it, moved in the set, and now calls it the home of its Monday night tapings. The Raw Space is located at 923 1st Ave. downtown. The house band, The Mondaze with DJ Teelynn. The opening night taping with Jesse and co-host Keith Foster kept the packed audience in the Raw Space laughing all night. 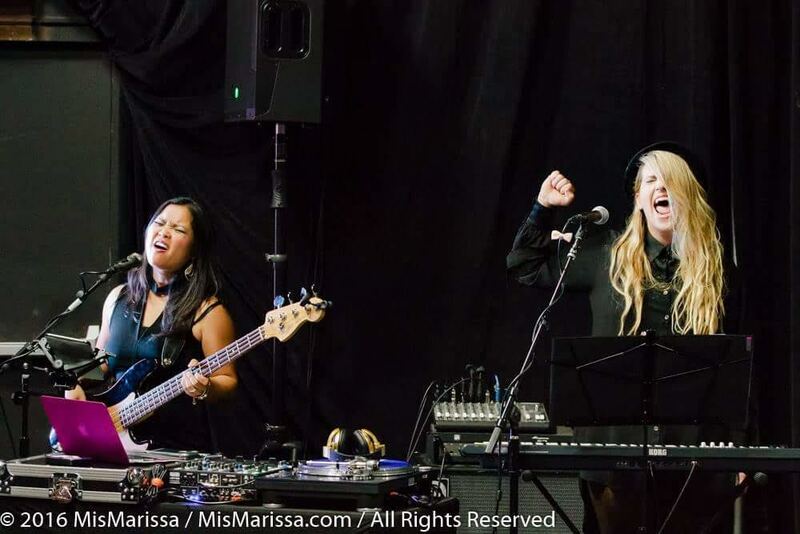 The house band, The Mondaze with DJ Teelynn, opened the show and kept the audience entertained during breaks. 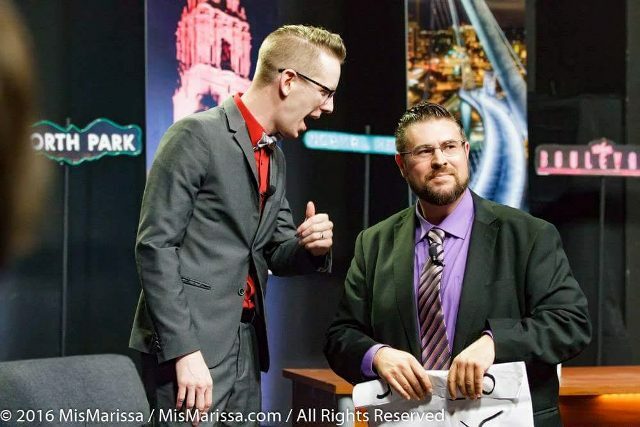 Illusionist Rodney Reyes was the first guest of an impressive lineup interviewed by Jesse. Next up was County Supervisor, Dave Roberts. 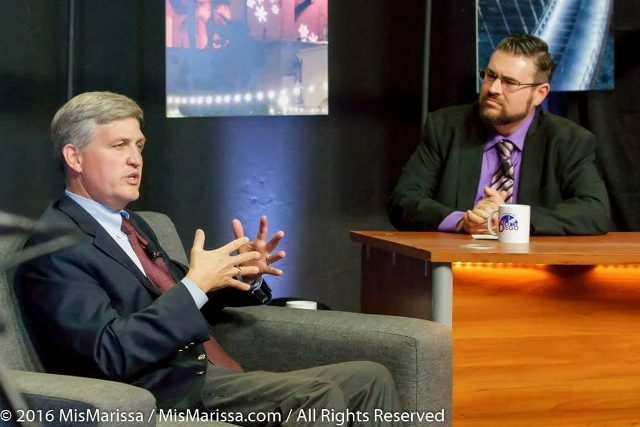 Supervisor Roberts is actively involved in promoting the film business in San Diego and he gave a strong voice to that initiative during his interview with Jesse. Wrapping up the night was a band of four young men inspired by The Beatles and the 1960s, The Bassics. Anthony Maze, magician, comedian, and official hype man of Tonight in San Diego, interacted with the the audience during breaks. On top of nonstop laughs and entertainment, the audience eagerly awaited prize give-aways, including shows at the House of Blues, iTAN gift cards, and Napizza gift cards. If you want a night full of laughs — tapings are Mondays at 7:30 pm at the Raw Space. Or watch the show online! Some of the upcoming guests include Action Sports Media Personality, Chris Cote; KUSI News Personality, Allie Wagner; Food Network Grocery Games Judge and Food Editor of San Diego Magazine, Troy Johnson; and Artist and Photographer, Aaron Chang. As a long time OBcean, Jesse just might even sneak in some good jokes about OB like he did on opening night. And he will definitely have you laughing. I could not agree more. I feel fortunate to have this show here in town. Things run smoothly considering the “last minute” challenges of a production like this show. During the second show, signs came loose and were swinging behind the talent, the camera work was choppy (cutting heads off) and the camera shots were off when Keith (Co-Host) and Jesse bantered. The audience can’t see Keith from the seats as the monitor blocks the view. I know these minor glitches will be corrected as the dust settles and everyone hits their strides. I’d like to see more video pieces like “asleep or singing” from show number one. That was funny. I would not mind a little edgier “headlines” with more neighborhood references. I enjoy the local (family) feel to the show, DJ Teelynn’s musical orchestrations are awesome, the interviews are good and most importantly, it’s entertaining. I intend to attend more tapings. Lots of fun jokes throughout the night and Supervisor Roberts even mentioned 4 of his favorite burrito places, his family heritage, what his house looks like, and the TV pilot “Pitch” which was recently filming in San Diego. He also talked about his 6 adopted county foster kids (ages 3 to 20) and his favorite film about politics. 6 adopted kids – what a man! And what an inspirational and fun night! #dontforgettheguac (That hashtag was the slogan for opening night and Jesse asked the audience to use this hashtag when posting via social media). Older Article: Is It All Coming Together?